After undergoing profound political transformations, the Danube region is now facing diverse demographic, labour market and migration challenges, yet lacks the appropriate multi-level governance support structures, especially in the field of migrants' economic integration. 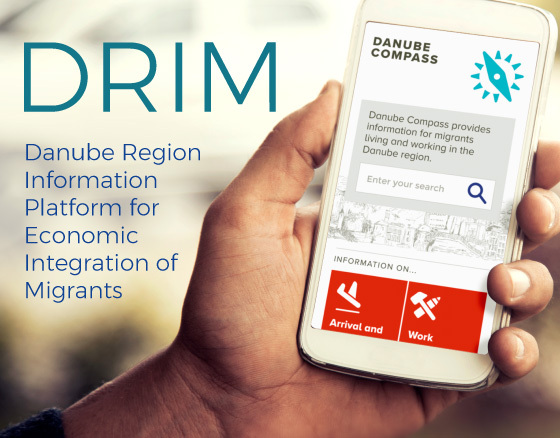 With the goal of achieving cohesion and economic development in the Danube region, DRIM's objective is to enhance the capacity of public institutions for promoting migrants’ economic integration, understood as fair access to employment, work and skills enhancement. The main result of DRIM – the improved capacity of public institutions to respond to the needs of newly arrived as well as resident migrants through effective information sharing – will be a corner stone of an information infrastructure that will facilitate economic integration in the Danube region. DRIM will achieve this goal through the following activities and outputs: a) conceptual framework for information sharing and the development of an info tool – DANUBE COMPASS; b) info tool testing (pilot action); c) learning interactions and evaluations to mainstream and disseminate DANUBE COMPASS; d) a strategy that promotes and mainstreams information sharing as a necessary step for migrants' access to employment. The outputs, especially DANUBE COMPASS, are an innovative attempt to respond to the transnational challenges with a transnational approach instead of national information infrastructures. The expected short-term impact is a better response of main target groups (local and national authorities) in supporting migrants' economic integration as well as migrants' – the secondary target group – easier access to employment and renewed trust in public authorities. The long-term change is expected to be the construction of an effective information infrastructure for migrants throughout the Danube region, with corresponding improved capacities of public institutions ensuring smoother integration and through that social change. DRIM - Book "Globe in Motion: Patterns of International Migration" published!